At the Anne Pederson Women's Resource Center Koryne Horbal lecture, two women were recognized for their courage and tenacity with the first annual Courageous Woman Awards. These awards acknowledge and recognize women who see injustice or need, act on it, take risks in order to "do the right thing," and raise their voices to champion women. Founded in 2011 by Friends of the Anne Pederson Women's Resource Center at Augsburg College, the awards program recognizes women who courageously strive for social justice and peace on campus or in the wider community and whose efforts, be they small or large, make a difference to women. The 2011 awards are given in memory of Jessica Nathanson whose life exemplified what it means to be a courageous woman. 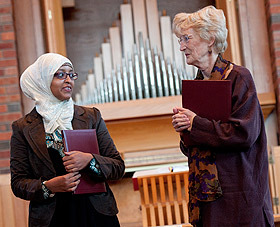 Fardosa Hassan was born in Somalia and graduated from Washburn High School in Minneapolis. She is now a senior at Augsburg majoring in sociology and international relations with a minor in religion. Her leadership was key to the Nobel Peace Prize Forum held at Augsburg. She worked to prepared the interfaith dialogue that occurred between former Prime Minister of Norway, Kjell Magne Bondevik; Rev. Mitri Raheb of Palestine; USAID leader Zeenat Rahman; and U.S. Congressman Keith Ellison. Fardosa served as an intern in the Kenya Parliament. Here her experience with Kenyan culture and politics led her to change her major. Fardosa's firm belief in the importance of basic human rights was strengthened by her experience in Kenya. It was there that she came to the realization that what she cares about most is women's rights: equal pay for equal work, and much more. Fardosa also completed an internship with Lutheran Social Services, where she had the opportunity to work on immigration and refugee issues. A founding member of Augsburg's Interfaith Scholar cohort, Fardosa was recognized by President Barack Obama and invited to the White House to take part in the Interfaith Campus Challenge. This further strengthened her strong belief of the importance of protecting basic human rights here and around the world. Marie Braun has spent nearly six decades, starting when she was twenty-something, working on behalf of peace and justice. She marched with Martin Luther King to Selma, and was further motivated by King's 1967 speech against the Vietnam War. Her effort has been constant, and her focus has been in helping those who need it most. Marie co-founded the Counseling Clinic in Brooklyn Center, which provided outpatient chemical dependency and mental health treatment to those who might otherwise not have been served. Marie, on behalf of the victims of war, has been to jail, traveled to Iraq, and demonstrated at Alliant Tech and in the offices of our elected officials. She has repeatedly risked arrest. Her primary purpose is peace, and in this, she strives to make a difference for women who always bear a disproportionate share of the ravages of war. Marie works relentlessly and with courage to bring constant attention to the immorality of war and the weapons of war, and to say, "You may not fund or carry out these wars in my name—not in my name."